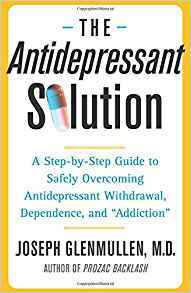 The commonly accepted wisdom from those with lived experience, and also from the few doctors who have taken the time to study and understand withdrawal effects such as Dr Joseph Glenmullen, is to reduce by around 10% of your previous dosage per month. This became my goal, even though I was aware that there are many factors that influence the success or failure of coming off antidepressant drugs. Now, one year in, I have found even that modest target to be beyond my ability to tolerate the wide range of unpleasant withdrawal symptoms. I have been in a daily grind, battling with physical and psychological withdrawal effects, that in themselves are far worse than my initially diagnosed depression and anxiety has ever been. I am fatigued and dispirited and yet all I have to show for that time struggling is a mere 50% reduction from my starting dose. I now have an extremely difficult decision ahead, many who have withdrawn report that the experience becomes more intense and more difficult the lower you go. To reduce further, I risk not being able to function, not being able to work or to spend time with my equally long-suffering family. If I remain where I am, I doubt I will ever get past the drugs. It is an agonising judgement call. The debate around antidepressant use is polarised and can be unpleasant to be part of. Much of what is reported ignores the real experiences that people have with these drugs. Experiences which are far removed from the sanitised short-term efficacy and tolerability trials, such as the recently reported meta-analysis published in the Lancet. A study which did not touch on withdrawal or dependence issues and so is, at best, an incomplete picture and not helpful to those trying to make a difficult judgement about the potential for benefit versus the potential for harm of antidepressant treatment. 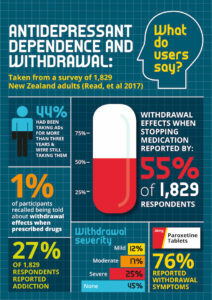 Antidepressant withdrawal transcends a simple drug efficacy debate, people may have taken and felt they benefitted from the drugs, only to have that benefit overturned when they come to stop and find they are physically and psychologically dependent. 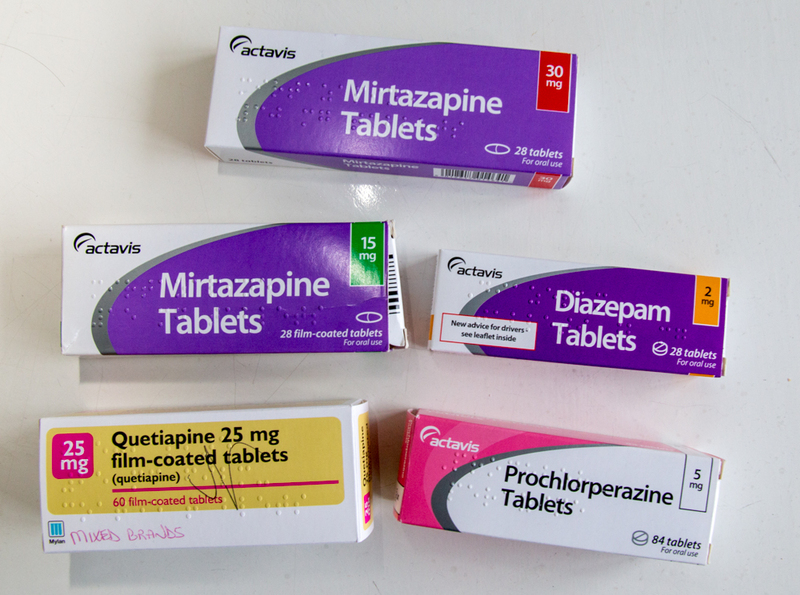 We prescribed 64.7 million antidepressant drugs in England in 2016 according to NHS Digital, yet we do not know how many are likely to struggle coming off the drugs and we have no answer to help those who are struggling. Antidepressants have been around since the 1950s, to not know how many experience withdrawal, particularly when long-term use is increasing, is an unforgivable and alarming gap in the evidence base. This issue is so important, that a group of thirty psychiatrists, academics and people with lived experience, including myself, have written to the President of the Royal College of Psychiatrists to challenge public statements made about antidepressant withdrawal. The issue was also recently reported in the New York Times with more than 8,800 people writing in to share their own experiences of coming off antidepressant drugs. I have a long and potentially painful journey ahead of me, one which I don’t feel I have the resilience within to make and one that I was not prepared for in any way when I first started to take my antidepressant drug five years ago. To help others avoid the situation I find myself in, all I ask is that doctors be clearer with patients about the likelihood of withdrawal, that it can affect up to 50% of those taking the drugs for more than a few months, and for some, those effects can be severe and protracted. Finally, I want to thank all those in grassroots support communities like Surviving Antidepressants, The Withdrawal Project, Mad in America and my own and other Facebook groups because, without their guidance and support, I would have nowhere to turn. These groups provide a vital sense of connection to help those who are in difficulty and have little to no ‘official’ guidance or support’. The fact that those with lived experience have had to self-support in this way is a sad indictment of the unwillingness of the medical profession to treat the end of drug therapy with as much care and attention as the start.